The Silverhill Institute is a non-profit organization that relies on private funding to support all of our initiatives. All of our supporters directly contribute in helping to bring forth applied research that is blanaced, reliable, and evidence-based, and importantly, focuses on environmental issues of the day. To help us make a difference, please donate. We appreciate all donations! You can donate to the Silverhill Institute or to a specific project that you want to support. Your company name or your name will be displayed in the supporters' section on our website (unless donors prefer to be anonymous). Every contribution also receives a charitable foundation tax-deductible receipt. Special Opportunity to receive Mrs. Pakki Chipps work! 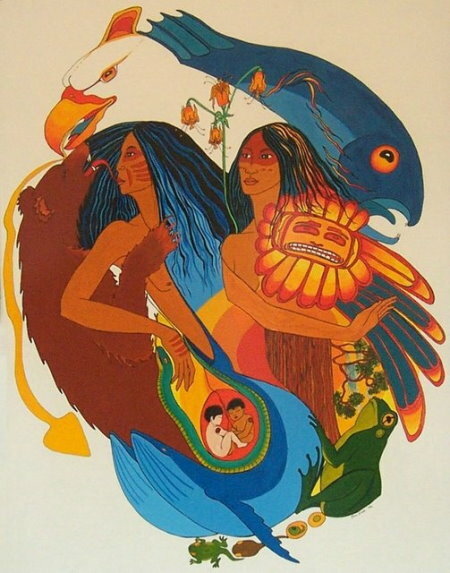 We welcome the support of an aboriginal artist � Mrs. Pakki Chipps � and we are pleased to offer a signed and numbered limited edition print for every donation of $100 or more. There are only 700 copies of the print, titled "Family", and 300 copies are exclusively reserved for the supporters of and contributors to the Silverhill Institute of Environmental Research and Conservation. The print is 20" x 27" and ready for framing. Prints by Pakki Chipps retail for $100 or more. A framed print will be provided for every donation of $250 or more. We wish to thank the many individuals who have provided support, both financial and in kind. We particularly would like to thank Anita McBride, Sonja Homenuck, Joe Pittari and Volney Campbell for their multi-year financial contributions.